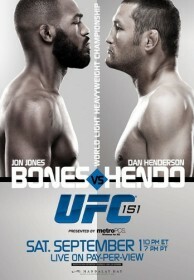 On Sept. 1, 2012, 25-year-old Jonny “Bones” Jones (16-1) will put his UFC light heavyweight title on the line against 41-year-old legend Dan Henderson (29-8) in the UFC 151 main event at Mandalay Bay in Las Vegas. Jon Jones is the heavy favorite with the odds set at: Jon Jones -620 vs. Dan Henderson +420. Henderson is currently on a four-fight win streak, having knocked out Renato “Babalu” Sobral, Rafael “Feijao” Cavalcante and Fedor Emelianenko, while in Strikeforce, and having won a unanimous decision against Mauricio “Shogun” Rua in his return to the UFC. Jones is on a seven fight win streak, with three wins coming via TKO, three via submission, and most recently, a unanimous decision over Rashad Evans.